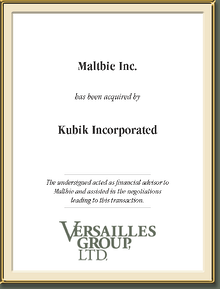 3i appointed Versailles Group to sell Maltbie as a result of Maltbie’s complex ownership structure and timing. The timing was related to the portfolio that included Maltbie. Versailles Group generated several bids for this interesting business by identifying synergistic buyers around the world. The challenge was to find a buyer that that could maximize the special labor economics and reputation of Maltbie. As a result of Versailles Group’s innovative thinking and international reach, Versailles Group identified several well-qualified buyers to bid on this business. The best and highest bidder was a Canadian company, which enabled Versailles Group to successfully close another cross-border transaction. Many of our transactions are confidential; however, here are a few that we can reveal.